The De Havilland Vampire was the second of the RAF's first-generation, post-Second World War jet fighters to enter service. It began life as an interceptor, but that was soon re-tasked in the day fighter/ground attack roles with the 2nd Tactical Air Force in Germany from 1948 to 1954 and with the RAF's Middle and Far East Air Forces. Throughout its forty-six year career, it collected many notable firsts: it was the first jet fighter to cross the Atlantic; the first jet to land on an aircraft carrier; and the first jet trainer on which student pilots qualified for their "wings". In addition to playing a full part in the RAF's order of battle during the 1940's and 1950's, the Vampire also served with the Fleet Air Arm and became an export success story for the British aircraft industry and hundreds sold to air forces worldwide. For a brief period between 1952 and 1967 the Vampire trainer was responsible for the steady flow of trained pilots for the RAF, Royal Navy and foreign air forces. This comprehensive history covers the Vampire's development and operational service. It has been written with the full co-operation of the manufacturer, MoD, RAF and other world air forces, mixing narrative and technical detail with vivid personal accounts form those involved with the aircraft. Comprehensive appendices include technical specifications, production details, serials and export details. It is also lavishly illustrated and includes more than one story of encounters with UFO's by RAF Vampire pilots. 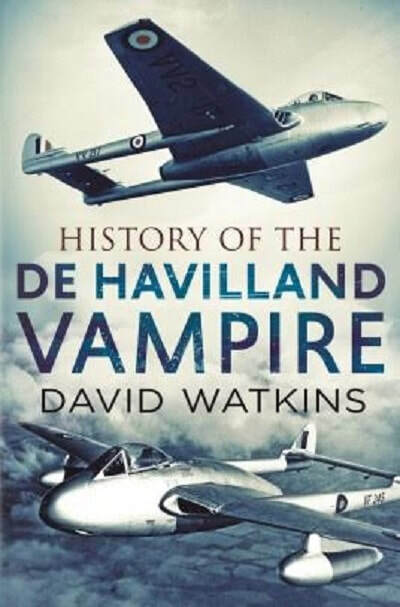 David Watkins is a former member of the RAF and a keen aviation historian with previous works including a history of RAF Chivenor, the De Havilland Vampire and Venom, 501 (County of Gloucester) Sqn., RAuxAF and a history of the RAF aerobatic teams from 1920. Fonthill Media Publications is based in the UK. This book contains 384 pages in 9 3/4" x 6 3/4" page format. The cover art shows 2 black and white photos of Vampires in flight. The one at the top has the serial no. VV217 on the sides of the fuselage. The one at the bottom of the cover has the serial no. VF245 on it. The top color photo on the back cover shows a formation of 6 Vampire's flying over a coastal area. Below it is a color photo of a Vampire with the no. 20 on the sides of the nose and serial no. WZ453 on the fuselage sides. The book contains 319 black and white photographs and 2 color ones on the back cover. Venezuala, Syria, Switzerland, Sweden, South Africa, Saudi Arabia, Rhodesia, Portugal, Norway, New Zealand, Mexico, Lebanon, Katanga, Jordan, Japan, Italy, Ireland, Iraq, Indonesia, India, France, Finland, Egypt, Dominican Republic, Chile, Ceylon, Canada, Burma, Austria and Australia. This book will be of great interest to both modelers and historians. I want to thank Casemate Publishing, the North American Distributor of Fonthill Media books.